Commemorative coin created to pay tribute to the ultimate sacrifice made by Reaves (Norfolk Police officer killed in the line of duty). NORFOLK — The police officer fatally shot Friday afternoon had no warning that a man was about to open fire, police said Saturday. The officer was identified Saturday as Stanley Cornell Reaves, 33, of the 100 block of Driftwood Drive, Chesapeake. He leaves behind a wife and two children, ages 2 and 5. 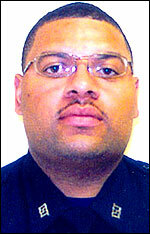 Reaves previously served with the Baltimore Police Department, which hired him in May 1993, until he relocated to Norfolk in September 2004. He graduated Norfolk’s police academy in March and hit the streets in the city’s first precinct. Around 4 p.m. Friday, Reaves had just left a call regarding a robbery, believed to be unrelated, and which other officers ultimately handled. He was flagged down by a person on 26th Street in Park Place, according to Officer Chris Amos, a police spokesman. The person told him that somebody was behaving “crazy” or “suspicious,” Amos said. Reaves, who was riding alone, pulled around the corner onto DeBree Avenue near 27th Street. He spotted the person and got out of his cruiser. He approached the man and a parked van on foot. “Without any warning, the suspect produces a gun and just shoots the officer,” Amos said. It was not known if the officer and the shooter even spoke, he said. The suspect fled. Reaves was tended by other police, then city paramedics who brought him to Sentara Norfolk General Hospital, where he was pronounced dead. Amos could not provide details of what had prompted the concern of the person who waved the officer down. Amos discounted an earlier statement from an animal control official that said police had been called to the area to assist in an investigation regarding a shot dog, saying he could find no record of such a call. Michael McKenna, president of the International Brotherhood of Police Officers Local 412, urged anyone with information to come forward. “If someone will kill a policeman, they’ll kill anyone,” he said. A fund is set up to assist Reaves’ family. Reaves is the third city officer to be fatally shot in recent years. Several others have been wounded in gun battles. While officers don’t brood about the dangers of the job, they are aware, he said. “In the back of their minds, it’s there. Every time an officer straps a gun on and goes to work, the possibility is there,” he said. Long after the news of Stanley C. Reaves’ death fades from the headlines, hundreds of colorful commemorative medallions bearing the slain Norfolk police officer’s name will help his memory live on. The coins sell for $20 each, with $15 of each sale going to Reaves’ widow, Treva Rose Reaves, and two young children, Reagan and Ryan. Smith, 41, of Virginia Beach, and her husband, Norfolk police officer Ray Smith, 52 – who worked in the same platoon as Reaves – are leading the effort and have sold about 400 so far. The coins are similar to a silver dollar in size and heft but are slick-surfaced and in color. The idea came from Jay Javey, a retired Virginia Beach police officer who had a similar coin made for Rodney Pocceschi, a Virginia Beach officer killed in the line of duty in 2003. Javey has since retired to Arizona and is making the coins not just for fellow officers but also for soldiers and others involved in the military. Sales of the Pocceschi coin raised $22,000 for the dead officer’s family, Javey said. Thomas A. Porter, accused of shooting Reaves to death on Oct. 28, is in jail awaiting capital murder charges. The officer killed while investigating a complaint about an armed man on DeBree Avenue in the Park Place neighborhood. Sandy Smith said that working as a dispatcher brings a unique closeness to officers, some of whom they never may meet. And working when an officer is in trouble makes an already-tense job worse. Smith has been spending her off hours delivering Reaves memorial coins to buyers, including many Norfolk businesses the officer frequented. She and her husband also have one of the Reaves coins at home, along with a Pocceschi coin. Reach Michael McNarney at mike@mcnarney.com. This story originally ran in the Norfolk Compass on Feb. 23. Check the Community Channel each day for occasional stories from the Suffolk Sun, Norfolk Compass, Virginia Beach Beacon, Chesapeake Clipper and Portsmouth Currents. Please click here to send us questions, suggestions or comments about stories featured on the Community Channel.